First, we compared glass and plastic cups to see which ones would create better sounds. After determining that glass cups sound better, we set off to build a water xylophone. I don't own a ton of matching glasses, so we used glass cups of varying sizes. My preschooler LOVES rainbows and food coloring. 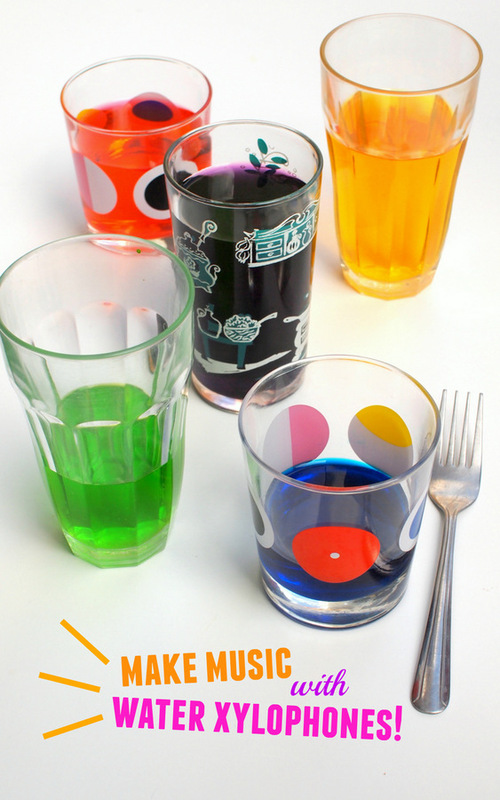 So of course, we had to drop food coloring into each glass to make everything look pretty! Then went through and I asked him to tap adjacent glasses to see which glass had higher and lower pitches. Then, we arranged them from highest to lowest pitch. And then we looked at two similar glasses and talked about how water level affected pitch. Then, we went bonkers and tapped all the glasses. Once he was done with the activity, we poured the water into our water table for some water play afterwards. If you're looking for other great ways to explore sound with your kids, check out these awesome posts below!